Apart Zurek traditional soup eaten at Easter is white borscht. 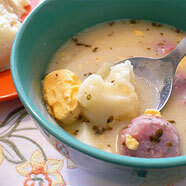 Soups look the same and are served with similar inserts – white sausage and hardboiled egg, but it tastes different. The subtle difference lies in the sourdough. 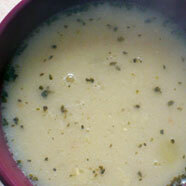 White borscht is less acid and more aromatic as it is cooked sourdough wheat flour and broth in bacon. Pour wheat flour into a clay or cup pot, add pressed garlic and pour over some warm but not hot water. Mix it with enough water so that a slurry forms, and then leave for about 4-5 days in a warm and sunny place. After this time it will have a distinctive sourdough sour smell (don't worry - disappears during cooking). The sourdough can be poured into jars or bottles and stored even a month. Add your sourdough to broth made with bacon. Do it up to your taste, so that the acidity is OK for your tongue. Add bay leaf, crushed garlic clove, allspice, horseradish, sliced carrots and diced white sausage. Boil the mixture. Then remove from heat and pour the cream distributed in several spoons of the hot soup. Mix it and season to taste with salt and marjoram. In the meantime, boil the potatoes separately - otherwise, they become hard and are distasteful. Cook until soup goes an intense aroma of meats and herbs. Beetroot serve with slices of sausage and carrots; you can also add hard-boiled egg.